CLICK HERE TO ORDER CUSTOM SLIPPERS! Sale! 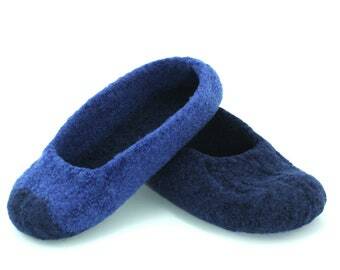 30% off mens felted wool slippers with suede leather soles. US size 8 and US size 11 (2). Sale! 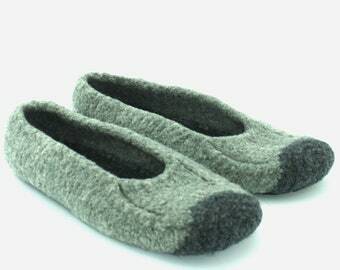 30% off mens felted gray wool slippers with Plasti Dip soles. Mens US sizes 7 and 9. Sale! 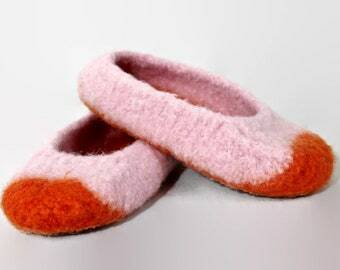 30% off womens felted wool slippers. Two pair US size 7. Choose sole type and color. Announcement Welcome to my shop! I hope you find something you like here - to give or to keep! Welcome to my shop! I hope you find something you like here - to give or to keep! Sale! 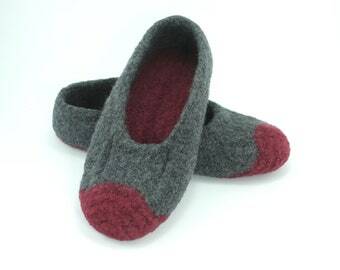 30% off women's slip on felted wool slippers. Color and sole choice. Two pair US size 7. Sale! 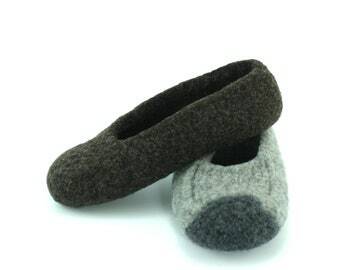 30% off Womens brown slip-on felted wool slippers with suede sole. US Women's size 7. Sale! 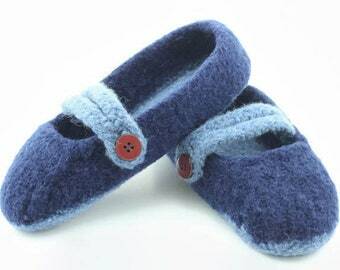 30% off womens felted wool slippers with suede leather soles. Two pair US size 6. Good quality product and are lovely. Thanks! Perfect! and right on time -- thanks again! This is my 3rd pair, I love them. I‘ve been knitting since I learned from my Brownie troop leader at the age of 8. I’m a retired grade school teacher and computer programmer, but I kept knitting throughout both of my careers. I made a lot of afghans in the evenings and on weekends to relax! After I retired I had more time to knit. My family and friends are the recipients of my efforts and I enjoy making and giving knitted items that will endure and be cherished. I hope you enjoy your shopping experience and find what you are looking for here. If not, select the "contact" button and tell me what you would like and I will see if I can help you. Order your shoe size for all custom made slippers. Order next size up for 1/2 sizes. Wash in cold water by hand. Wring or spin in washer. Shape to size and air dry. NO hot water or dryer. PLEASE BE CLEAR ABOUT YOUR COLOR CHOICES WHEN YOU ORDER SLIPPERS. YOUR ORDER WILL BE DELAYED IF I CAN'T UNDERSTAND WHAT YOU ARE REQUESTING. Example: Light gray upper, burgundy sole and trim. I do not accept returns or exchanges. The slippers are custom-made by size and color and not easily resaleable.